A spectacular building in Ecuador was meant to be a symbol of South American unity, but following a shift in regional politics it now lies increasingly empty. It’s a gravity-defying edifice that befits the lofty ambitions of what was supposed to be a symbol of South American unity. Set against an arid moonscape on the equatorial line, two cantilevered glass wings soar dramatically above a reflecting pool, symbolising freedom and transparency – and looking like something out of a science-fiction movie. But for all its architectural grandeur, the headquarters of the Union of South American Nations (Unasur) outside Ecuador’s capital seems as moribund as the group itself. What was once an aspiring diplomatic hub bustling with official translators and cocktail parties for visiting dignitaries looks more like a ghost building, with barely half the staff it had when it was inaugurated to great fanfare in 2014. The group’s chief architect, former Brazilian president Luiz Inácio Lula da Silva, is in jail on corruption charges while another, Venezuela’s Hugo Chávez, has died. “Unasur was a good idea, but ultimately didn’t deliver concrete results,” said Michael Shifter, the president of the Washington-based think tank InterAmerican Dialogue. In April, half of Unasur’s 12 member-states — Argentina, Brazil, Chile, Colombia, Paraguay and Peru — stopped paying dues and suspended their membership. Then in August, newly elected Colombian President Iván Duque renounced the treaty altogether, paving the way for his country’s withdrawal in February. The result is a US$20-million deficit that has led to across-theboard budget cuts. At the current rate, the group, which has been without a secretary-general for two years, will burn through all of its cash reserves by April. That’s around the same time that Brazil, whose incoming President Jair Bolsonaro has criticised Unasur, takes over the group’s rotating presidency. For critics who see Unasur as little more than a wasteful monument to leftist overreach during the previous decade’s commodities boom, its headquarters make a convenient target.Designed by Ecuadorean architect Diego Guayasamin, the US$43-million building was built and donated to the group by former Ecuadorean President Rafael Correa. 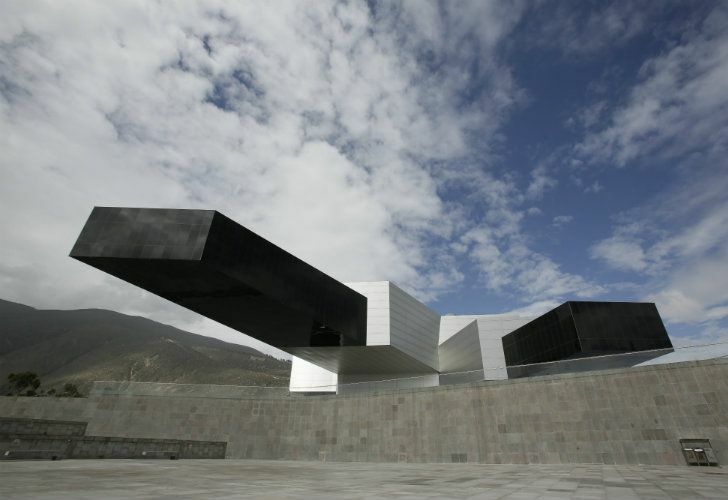 The prize-winning building, 75 percent of which is underground, is equipped with a stateof-the-art assembly hall, an impressive art collection and salons named for leftist icons like Chilean poet Pablo Neruda and Nobel Prize-winning novelist Gabriel García Márquez. Just like in public buildings in socialist-ruled Venezuela, Chávez’s bright-red signature and fiery citations dominate the hallways. “It’s absurd that a building that cost several dozens of millions of dollars has no usefulness,” Ecuadorean President Lenín Moreno said in July while announcing that he would demand — illegally, it turns out — that Unasur return the building so that it could be repurposed as an indigenous university. But for most of its critics perhaps the biggest eyesore is the giant bronze statue at the entrance showing a striding Néstor Kirchner, the first secretarygeneral of the bloc. Since his death in 2010, Argentina’s former president has seen his legacy tarnished by allegations of corruption. Supporters of Moreno are leading a campaign to have it removed. Unasur was created in 2008 to breathe life into independence hero Simón Bolívar’s dream two centuries earlier of a giant, borderless South American “homeland” to deter US and European designs on the continent. While ambitious plans to create a common currency fell flat, other proposals like creating a common Unasur work visa — which has helped nations absorb the masses of Venezuelans fleeing their crisiswracked country — have had more success. Decisions required the consensus of all members, which was easy when the so-called “pink tide” of leftist leaders was sweeping across the region, mistrust of the United States was running high and governments were flush with cash. But in identifying so closely with the left and fixating on the US, it inevitably lost support when the political tide shifted, Shifter said. He argued that the fatal blow was Unasur’s failure to deal effectively with Venezuela’s crisis. During 2015 and 2016, Unasur’s then-secretary-general Ernesto Samper frequently travelled to Caracas accompanied by representatives from the Vatican to promote talks between the government and opposition as tensions on the streets were running high. Samper, in an interview, acknowledged that for Unasur to survive it needs to adopt a lessprogressive agenda, but argued that dismantling it would be a huge mistake. He said there’s a vital need for the region to speak with a common voice as the Trump administration threatens military action against Venezuela, stigmatises Latino migrants trying to enter the US and withdraws from international efforts to fight climate change.